Add to Favorite Sellers. Sterling Industries 8903-038 Abilene Natural with Nickel Steer Horn. Like a battle-scarred natural steer horn. Introducing our Abilene Set of 2 Decorative Horns: Featuring a distinctive Grey and Black color story and authentic Milky White charge marks enhanced by a generous layer of polish. Perfect to bring swagger to any executive or residential space. Stylish Raw Nickel stand. Category: Decorative Objects & Figurines. Finish: Natural with Nickel. Height:22.00 in. Diameter:4.00 in. Backplate/Canopy Width:0.00 in. Backplate/Canopy Length:0.00 in. 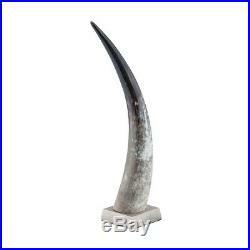 Abilene Natural Steer Horn. Established in 1992 as two showroom locations in The Lighting District of New York, Lighting New York (LNY) has since evolved into a leading retailer in the eCommerce realm of the lighting industry. At LNY, we offer architectural and portable lighting for any atmosphere and application, including wall and ceiling fixtures, fans, and lamps. In addition to light fixtures and lighting accessories, decor and furniture are also gaining momentum with the company and have contributed to LNY becoming a one-stop destination for all of your residential and commercial design needs. Whether your style is traditional or contemporary, rustic or vintage chic, LNY has fixtures available in a variety of finishes, materials, and textures to complement any design aesthetic. Layer your lighting to illuminate and highlight all the right spaces, or indulge in a glamorous statement piece. Either way, LNY’s vast product offerings from over 130 brands delivers limitless opportunities in finding the perfect light fixture(s) or decor to create the space you’ve always wanted. As lighting experts in both residential and commercial settings, as well as indoor and outdoor environments, LNY provides outstanding customer care and over 100 years of combined Lighting Expert experience, ensuring that all of your needs will be met, concerns will be alleviated, and your home will be perfectly decorated and illuminated for years to come! Please read the Product’s Details for further information. Orders will be subject to cancellation. Credit is not guaranteed. Excludes Clearance/Closeout and Open Box items. No cut, clipped or stripped wires. No writing on original packaging. Must include all papers, parts, and associated pieces. Must not be a Clearance/Closeout or Open Box item. Items must not be modified, installed or used in any way. HOW TO SET UP A RETURN. Setting up a return request online is quick and easy. Select “Return This Item” to start the return process. Reasons or additional instructions will be provided with any denials. In the event an item is damaged in transit, we will do everything we can to resolve the problem immediately. Please Note: Photos are required to process damage claims and we may be unable to process your request without photos. One of our Customer Care Advocates will instruct you on how to get your item replaced or get the correct parts. Lighting New York does not sell or lend customer information to third parties. Lighting New York guarantees all products against all defects for 30 days. Send us a message. Customer Care Hours: Monday – Friday 8am to 4:30pm EST. Lighting New York observes the following holidays and will be closed. View more great items! This listing is currently undergoing maintenance, we apologise for any inconvenience caused. The item “Sterling Industries 8903-038 Abilene Natural with Nickel Steer Horn” is in sale since Monday, April 15, 2019. This item is in the category “Home & Garden\Home Décor\Figurines”. The seller is “lightingnewyork” and is located in Selinsgrove, PA. This item can be shipped to United States. This entry was posted in sterling and tagged in 8903-038, abilene, horn, industries, natural, nickel, steer, sterling.